Tonight's show is at the Forum in London, capacity of about 1800. Lots of celebrities, like Chrissie Hynde and Peter Gabriel. Wow. I was hoping for Mick Ronson. The Velvets do a killer version of "Hey Mr. Rain" which must be about twelve minutes long. They're also doing a new song in the encores, "Coyote." After the show, we go back to the Columbia Hotel and sit in the bar. 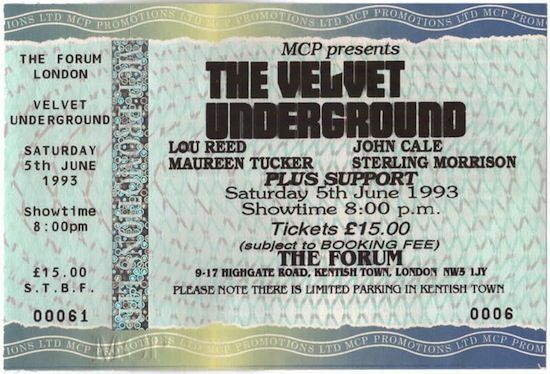 In April 1993 Luna were invited to open for The Velvet Underground on their reunion tour around Europe. Dean Wareham kept a diary of the tour which was published in the November 1993 issue of Alternative Press, I've just lifted that article and chopped it up into days and will post it here over the coming days - all without permission - if anyone objects give me a shout.